India Gate – India gate was built as a memorial in honour of Indian soldiers who sacrificed their lives in the Afghan wars and World War I. It is situated along the Rajpath (meaning King’s way) Avenue. Rashtrapati Bhawan – It is the palace for the President of India built in Indo-Western style. It was built before Indian independence for the Governor General of India. Sansad Bhavan – Sansad Bhavan or the Parliament of India is the supreme legislative body of India. It is a circular building designed by the British architects Sir Edwin Lutyens and Sir Herbert Baker. Raj Ghat – Raj Ghat is on the bank of Yamuna River and is a memorial of Mahatma Gandhi- ‘The Father of the Nation’. It is a black marble platform and marks the spot of Mahatma Gandhi’s cremation. There are two museums nearby which are dedicated to Mahatma Gandhi. Humayun’s Tomb – It is the Tomb of Mughal Emperor Humayun built for his widow Hamida Banu Begum. This tomb later acted as a model for other monuments on which other Islamic monuments where built by the Mughals in India. Purana Qila – It was the fort built by Humayun in the ancient city of Indraprastha (present day Delhi). Later he was over thrown by Sher Shah Suri who was the founder of the Islamic Sur Empire in the Indian subcontinent. He did some significant modifications to the fort. Red Fort – The fort was built by Mugal Emperor Shah Jahan and it took 10 years to complete. It is in the walled city of old Delhi. Safdarjung’s Tomb – It is known to be the ‘last flicker in the lamp of Mughal architecture’. It is a garden Tomb in marble Mausoleum. 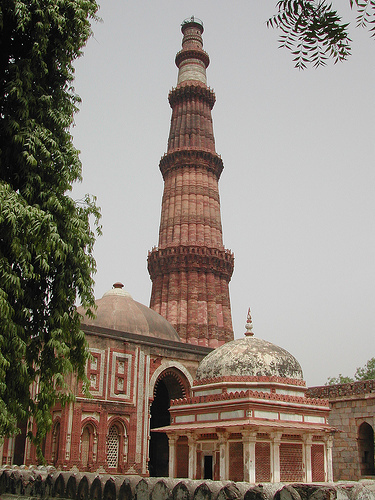 Qutub Minar – It is the tallest minaret in India and has 379 steps to reach the top. It was started by Qutb-ud-din-Aibak and was completed by Iitutmish. Tughlaqabad Fort – It is a ruined fort in Delhi built by the Gazhi Malik the founder of the Tughlaq dynasty. It was built in 4 years. Akshardham Temple – It is the largest Hindu temple in the world built in the last decade in the year 2005. It is an architecture marvel of modern India built in the style of ancient Indian architecture and encompasses the tradition and essence of Indian spirituality. It has been described as “an epitome of craftsmanship”. Laxminarayan Temple – The temple is also known as Birla Mandir built by the industrialist J. D. Birla in 1938. It is the temple of Hindu goddess Lakshmi and her consort Narayana. ISKCON Temple – It is a famous Vaishnav temple of Lord Krishna and Radharani in the form of Radha Parthasarathi built on Hare Krishna hills. Lotus Temple – It is the temple built in a flowerlike shape and hence commonly known as the Lotus temple. It is the Bahai community temple. Gurdwara Bangla Sahib – One of the largest Gurudwaras in India and the place where the eighth Sikh Guru, Guru Harkrishan lived his last breath. Gurdwara Bangla Sahib. Source: Wikimedia Commons. Jama Masjid – It is the best known mosques in India and was commissioned by Mughal Emperor Shah Jahan. Cathedral Church of Redemption – It is also known as Viceroy church which was used by then viceroy of India under British. Cathedral Church of the Redemption. Source: Wikimedia Commons. National Agricultural Science Museum and National Museum – Both the museums are the house for the pre-historic to present artefacts and displays. Jantar Mantar – Yantra means instruments and mantra means formulae. These are the huge instruments built by Maharaja Jai Singh of Jaipur. It consists of 13 architectural astronomy instruments. Lodhi Gardens – It is park on Lodi road spread over 90 acres of land with historical monuments. Chandni Chowk – Chandni Chowk or “moon light square” in English is the busiest whole-sale market in India today. It was built by Saha Jahan and designed by his daughter Jahan Ara. Apart from these there is one more tomb or the monument which is a must see when you are in Delhi. This is not inside Delhi but no one returns home without visiting this place! It is in Agra and it is nothing but the world famous and one of the wonders of the world, the splendid Taj Mahal. If you have been to Delhi and have your own best places to visit in Delhi, leave a reply. 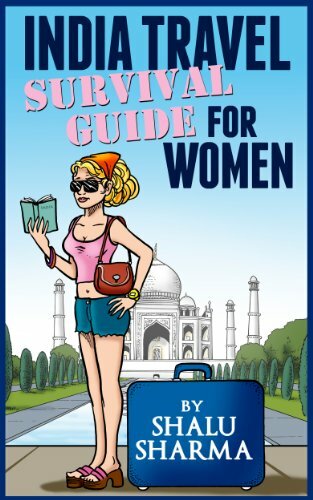 Very good compilation of great use to travelers. Thank you for this list. I always go to Delhi but have not been able too all of the mouments. Next time I am there I will go and see the Lotus Temple. there is so much to see in Delhi, I would really like to visit it sometimes. I only got to visit Kolkata and Mumbai when I was in India. Great places! These are the best places in Delhi to visit. I have been to the Akshardham Temple and its a marvel. Absolutely stunng. Delhi is a good place for a holiday. 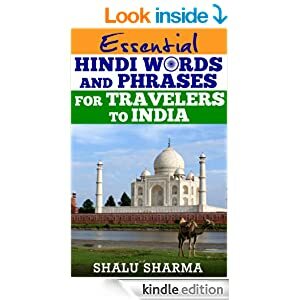 Hi there I am kind of new to your site, and I am glad that I have seen such wonderful place in India, to be honest my father used to be an Indian his name is Kirpal Singh Cudail, from Bombay, I still remember his story about this wonderful places in India such as Delhi, the Taj Mahal and many more. I would love to visit India some time in the future. Indeed it’s really a beautiful place. Excellent post, thanks for sharing your knowledge of Delhi. It’s one of the ‘you must see it in order to fully appreciate it,’ type locations, isn’t it Shalu? 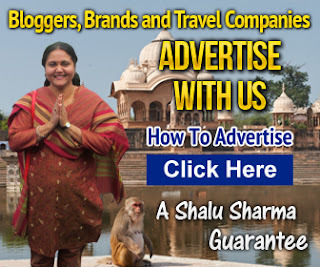 You have included almost all the tourist locations of Delhi. But you may have included places for shopping, eating and may be Gardens as well. All the places are indeed the best places to see in Delhi and we can see the foreign tourist around these places. Loved this post so i have already put a like on my Facebook page. These are must see places in Delhi. So Nice.Thanks for sharing the post. Chandani Chowk and the Lotus template are the best for me. I have visited both and are these are excellence place as you mentioned. Akshay, I agree with you. Chandani Chowk and the Lotus template are the best. I’m from UK and wants to Visit TajMahal. Is there any Tour package offered by you ? 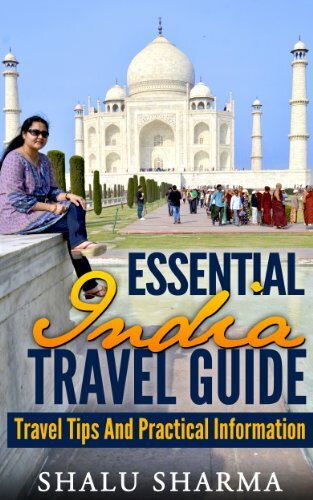 This guide is very much useful for Indians as well as foreigners , who want to visit Delhi. Akshardham temple, Lotus temple and Red fort are my favorite places and probably the most preferred destinations by tourists as well. thanks for the list!! All the places are indeed the best places to see in Delhi and we can see the foreign tourist around these places.Such a great yet interesting post. Thank you very much for sharing this helpful stuff. Thanx for providing such a great overview of Dehli. Hoping i will visit India. NIce temple – well built, makes you to be close to God, also has nice places for the every one to enjoy and learn in the complex. do not carry extra stuff, as lot of security. Good prasad also there. india gate is awesome place in delhi. As well it has great history too, behind the construction of india gate. These tourists spots look so beautiful! This will definitely go on the list of vacation travel destinations for me. Thanks for sharing this. Great post. So many places to visit and so many things to know. Thank you for sharing these lovely tips with us. Nice post please post more on this topic I am waiting for next one.